RIO DE JANEIRO, BRAZIL – According to a report yesterday in the Folha de São Paulo newspaper, demonstrators gathered at the boat stations of the Rio-Niterói ferry to protest about a rise of 60.7 percent in the cost of the passage which will take effect on Saturday. 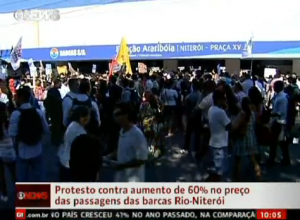 Protests over the Rio-Niterói ferry price hike, image recreation. The current ticket price is R$2.80. On Saturday it will rise to R$4.50. Even though the price hike is well above any corresponding economic indicators, according to the report, the company claims it has accumulated losses of R$106 million between 2003 and 2008. The boat company also argues that the pricing structure, which has been in place since 1998, does not allow them to cover the costs of operating the ferry. “I use the boat everyday to get to work and it seems unjust that they put the price up so much in one go. The price of everything around here just seems to be going up and up,” said Paulo Gonçalves from Niterói. In addition to the protests, many people waited for hours to sign up for the “Bilhete-Único” program which gives discounts on inter-city travel and reduces the fare to R$3.10. The ferry leaves from Niterói center and arrives at Praça XV in 15 minutes, but stops at 11:30PM. Another popular public transportation option is to travel by bus over the Rio-Niterói bridge. The more modern, air conditioned ‘1001’ buses (761D, 751D and 741D) make stops all over Rio and cost R$5. However, during rain storms or rush hour, the bridge can become extremely congested, making the ferry comfortably the best option.